If you feel nostalgic about the old, conventional casino slot games, try out this multispin classic slot released by Playtech in 2009. Do not expect Scatters, Multipliers, Bonuses and other modern wonders, but you might find yourself enjoying few of its own unique features. Need another reason to play? Here it is: you are looking at one of the highest payout slots you can find in any offline casino or online slots site. #5 to be exact. Apart from choosing the coin value, you can also pick Bet One or Bet Max, resulting in line bets from $0.01 to $25.00 and max total bet of $125 per spin. The highest paying symbol is Wild, represented by the Tiger, which will pay 2,500x your line bet if you are betting Max, and 2,000x if you are betting One. Red, yellow & blue Parrots act as your medium value wins, while the bottom group includes Citruses, Frogs, Flowers and Pineapples. 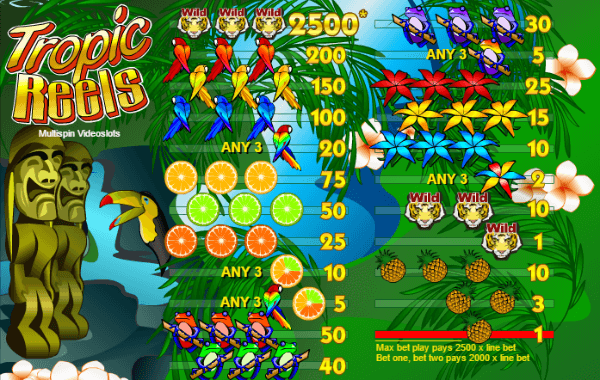 Most of them cash out when 3 on line, except the Wild and Coconut icon which will pay for two and even one of a kind. 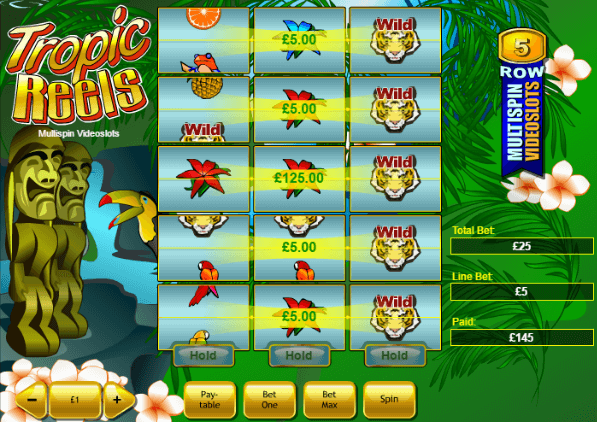 Now to the best part: Tropic Reels slot offers an incredible 98.95% RTP. The first spin will reveal only the symbols at the bottom line of each reel. At this point you can choose to Hold any (or all three, or none), which will result in the bottom icon being replicated across the whole reel. Then you get your 2nd spin to hopefully hit one or more winning combinations. You will notice that each symbol area spins independently of others and quite often you’ll find that few of them stop “in between” symbols – obviously, these can’t be part of a winning combo. Tropic Reels is not the only game of this type. Due to their success, Playtech launched a line of similar 3-reel slots. All of them offer very high RTP: Ocean Princess and Ugga Bugga Slot with 99.07% and Goblin’s Cave with 99.32%, making the loosest casino slot in the world. After the initial “what the hell” reaction after seeing the game, and then doing a few spins, we got kind of hooked for a while. It was entertaining to play and we did manage to get a few decent wins, but overall, nothing to write home about. Providing your 1st spin gives you two symbols potentially forming a higher-value combination and holding their respective reels, you can collect nice amounts on the 2nd spin, but real big payouts seem to be kind of elusive. High returns are possible, but you really need to know your way to make it click.